Finding the right outfit to wear to a wedding can often be a tricky task. Whilst an invitation may give you a guideline, it can be difficult to decipher exactly what is appropriate. We have broken down the most common wedding dress codes so that you can pick the perfect outfit to celebrate in! 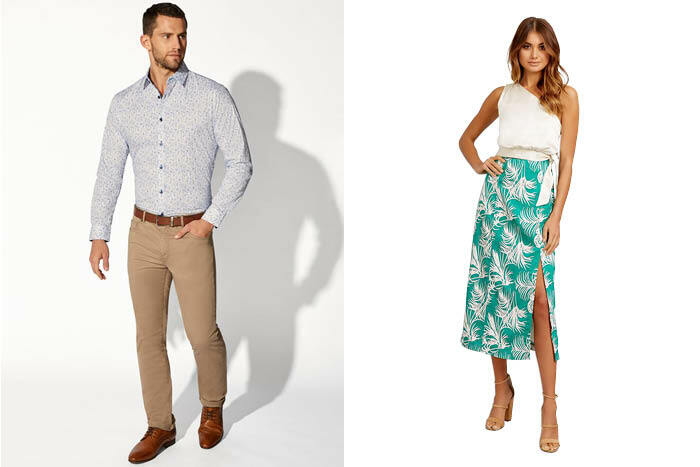 As the name suggests, a smart casual dress code is suited to a more relaxed and laid-back wedding vibe. As tempting as it may be to think of smart-casual to mean jeans and a nice top, this is not the case. For the ladies, a dress, skirt or pants are all lovely options. Pair with a stunning top and some dressy heels or sandals. For the men, a collared shirt and nice trousers or pants is both casual and smart! A semi-formal sits just across a casual dress code. Your look should still include a formal element, but offers you a larger range of options. For men, a suit is the way to go. Try a lighter tone for those day time weddings and darker for the evening. Avoid black where possible as this begins to cross into the formal territory. Ties are also optional so it's totally up to you! For the ladies, both a full length or cocktail length dress are acceptable. If you are wanting to wear something a little bit different, a dressy pantsuit or jumpsuit are both very chic options! A cocktail dress code sits just below a formal look. For men, opt for either a darker suit (navy, black or charcoal all work) or a combination of smart trousers and a blazer. Mix with a lighter toned shirt, add a tie and you have the perfect cocktail look! For women, you have some options! A dress is a must, and be sure it isn't too short or revealing. Keep the look dressy and smart. A formal dress code implies that black tie is optional. In this case, men may choose to wear a tuxedo or a black suit. This will more commonly be matched with a black tie but you can add a bowtie for an extra element of style. For the ladies, a cocktail dress is best. This can be either floor or midi length. Don't forget to make sure you style your look with some elegant jewellery and a glamorous heel. 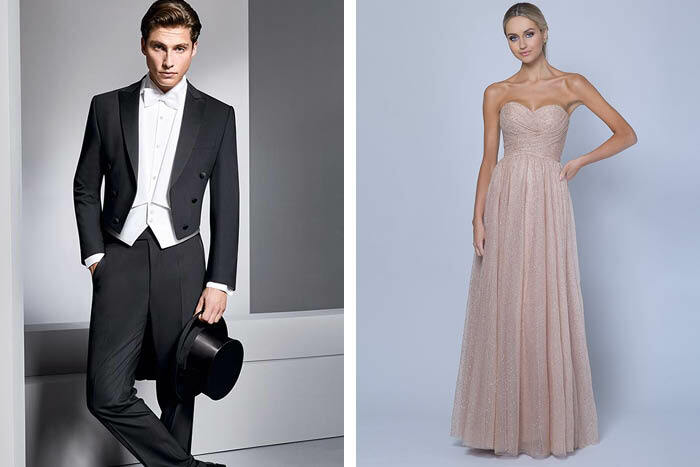 More commonly used for evening weddings, black tie means it's time to really dress up! For men, you can channel James Bond is your tuxedo. If a bow-tie isn't quite your thing, a sophisticated black tie is acceptable. For the ladies, a fabulous floor length gown is your best option. You can also opt for a cocktail length gown but ensure you keep it elegant and classy. Don't forget to add a dressy heel! Now this one is as formal and regal as they come. When we hear white tie dress code, we can't help but think of the royal wedding! For men, this dress code consists of a black tailcoat, a white shirt, white bow tie and formal black shoes. For women, a full-length ball gown is a must! Think the Met Gala and the Oscars. 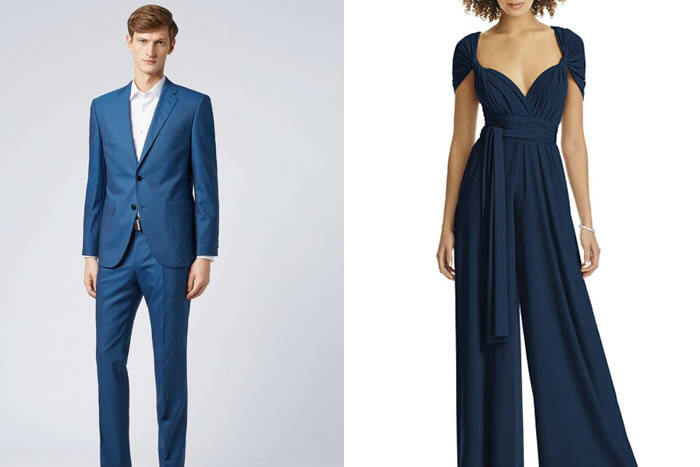 If you are getting setting away for a wedding, then you have to pack the perfect outfit! The first thing to factor in for this is the weather. If you are heading to a warmer climate, pack lighter clothes. Ladies, light floral dresses and dressy sandals are a great option for warmer weather. For the men, a linen suit or collared skirt with more dressy shorts or pants work as well. 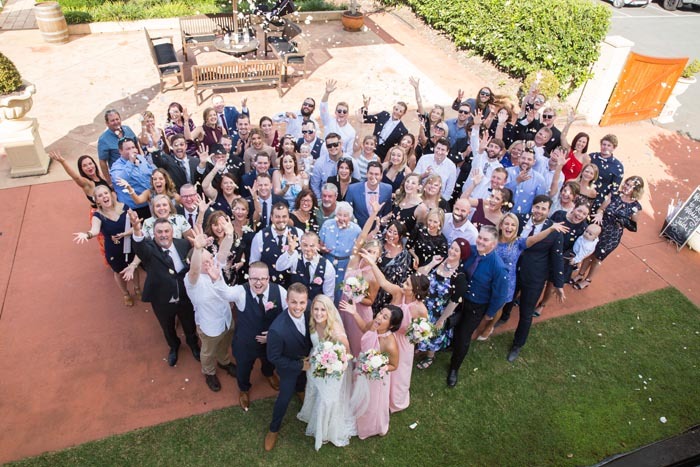 When attending a wedding, there are a set of guidelines which are generally applied to each celebration. Whether they are based on traditions or are not so commonly known, avoid breaking these wedding dress code rules. This will almost certainly upset the bride and will grab the guests attention for all the wrong reasons. Leave that new white dress at home and let the bride shine on her special day. If there is a dress code that permits white, then go for it! Most importantly, don't ask the bride if it is ok to wear white. This can really make things awkward and uncomfortable! Whether you will be surrounded by family, friends, or will only know a few people at the wedding, be sure to keep your look appropriate. Save the mini dresses and plunging necklines for a girls night out and keep your look classy and sophisticated. Whether or not the dress code is your style, this is the couples special day! Make sure you follow the guidelines that they have provided and if you are unsure, don't be afraid to ask! If you're looking for a way to thank your guests, then check out some of our favourite ideas here!